As you work on scenes, their nature and content may change and the name of the scene may no longer be relevant. When this happens, you can rename the scene. Make sure no one else is currently using the scene. Failure to do this may result in file corruption and loss of your work. Wait until everyone is offline. This ensures no one can open the scene while you rename it. 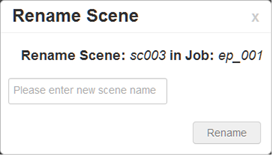 From the Scenes list, select a scene to rename. The Rename Scene window opens. Enter the new scene name and click Rename. Use lower case letters if the scenes may be used with a Windows workstation. When creating a new scene or renaming a scene, the scene name cannot exceed 23 characters.